This lovely statue, located in front of the cathedral of Antwerp, depicts the tragic tale of Nello and Patrasche. In 1872 the English author Marie Louise de la Ramée, also known as “Ouida”, wrote a story about an unconditional friendship between a boy, Nello, and his dog, Patrasche. As an orphan Nello sold milk in the city of Antwerp. One day he found a dog on the streets who became his best friend. Even after several setbacks, Nello remained grateful for the little things he had, but on a Christmas Eve he and Patrasche die peacefully together in the cathedral of Antwerp. 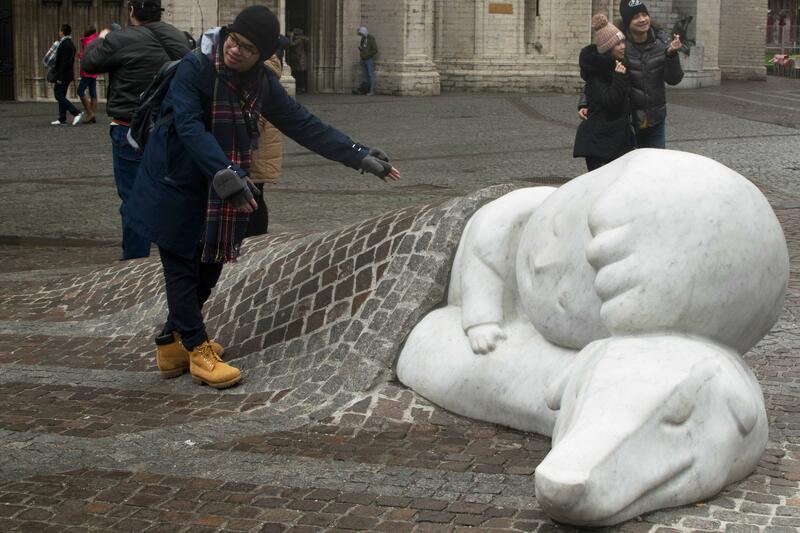 To remember this beautiful story, around Christmas 2016 the Belgian artist Batist Vermeulen, also known as “Tist”, created this statue which combines white marble and cobblestones. Photogrammetry model, pictures taken with Nikon D5300 and AF-S NIKKOR 35mm 1:1.8G lens, photos enhanced in Lightroom, processed in Reality Capture. Model decimated in ZBrush, cleaned in Rhino.